Ready to go gourmet on your next holiday? You will have to demand the finer things in life, and Ariana Villa certainly fits the bill. Located just five minutes from the pristine Smuggler’s Cove beach, this four-bedroom villa has the beautiful views you would expect, but it also comes complete with not one, but two gourmet kitchens so you can find your inner foodie while soaking up some tropical rays. The two-story home itself includes two bedrooms with en-suite bathrooms, while the guest house has just a single bedroom area. Both spaces, though, have modern kitchens, stainless steel appliances, and granite counter tops, so whether you choose to serve your culinary masterpieces in the alfresco dining area or somewhere else in this postcard-setting, you simply can’t get more gourmet than this holiday rental. Steps away from Smuggler's Cove! This is a four-bedroom property located at Smuggler’s Cove. It includes an infinity pool and panoramic views of the Atlantic. It is just a few minutes from Smuggler’s Cove Beach. 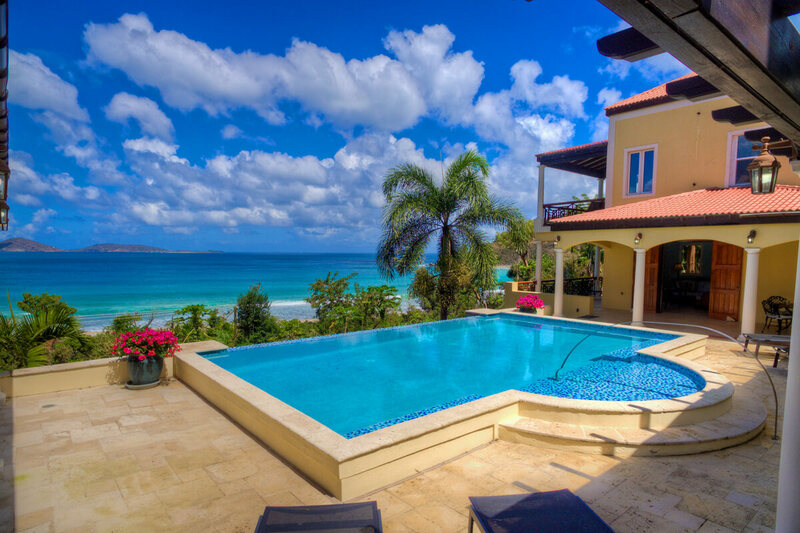 Villa Ariana is located in Tortola’s West End. The home has been designed to accommodate friends and family. It has high vaulted ceilings throughout and a number of shaded outdoor areas. An infinity pool with stunning views of the ocean is framed by three buildings, nicely separated for privacy: the Main House, the Studio and the Guest House. In total they offer a choice of four spacious bedrooms. The Main House features a vaulted ceiling over an open-concept kitchen and spacious living room. When the four French doors are open, the outdoors becomes the indoors, completely exposing you to the wonderful Caribbean breezes. Enjoy the expansive, covered al fresco dining area with built-in top-end gas BBQ grill, stunning pool terrace and a sheltered “grotto” space with a custom-built bar located underneath the Studio. There are four bedrooms. The two-story Main House offers two bedrooms both with en-suite bathrooms. The bedroom on the ground floor has direct deck access, ocean view, walk-in closet, and a bathroom with a walk-in shower that includes a space to sit while showering – perfect for guests with limited mobility. On the second floor, there is an even larger bedroom with a private balcony, ocean view, walk-in closet, full bathroom with large bathtub and shower, and an adjoining alcove that has a crib. The two-story Guest House has one large bedroom with full ensuite bathroom, an ocean view, a private balcony and an adjoining small room suitable for use as a study or child’s room. The Studio has a bedroom with ocean views and an adjoining living room with writing desk, a powder room, and tucked away outside, an enclosed stone outdoor shower. It is only a 15-minute drive to Sopers Hole Marina where there are shops, restaurants, and sailing charters. It is also located near the West End, which offers ferry services to St. Thomas, USVI, or Jost Van Dyke. An eastward drive puts you within range of Long Bay and Cane Garden Bay. Villa Ariana works well for families, friends, or romantic vacations. Walk to Smuggler's Cove in less then 10 minutes!